Supported by National Natural Science Foundation of China (81400669, 81470885), Scientific Research Project of Shanghai Municipal Commission of Health and Family Planning (20144Y0255), and Youth Initial Research Fund of Second Military Medical University (2013QN13). Abstract: Objective To explore the effect of osteopontin (OPN) on pancreatic stellate cell (PSC) and its mechanisms. Methods We transfected PSC with OPN lentiviral overexpression vector (OPN-O/E) and constructed empty vector control cells (control group). After PSCs were treated with OPN-O/E or OPN-O/E in combination with Akt inhibitor LY294002 (10 μmol/L and 50 μmol/L), the proliferation ability and chemotactic activity were detected by CCK-8 and Transwell assays, respectively. 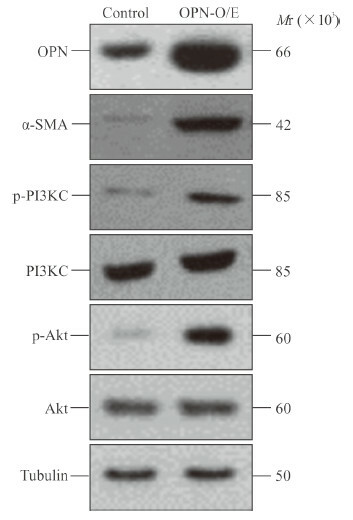 The expression levels of α-smooth muscle actin (α-SMA) and related proteins of PI3K/Akt signal pathway were determined by Western blotting. Results Compared with the control group, proliferation ability and chemotactic activity of PCS were significantly increased in the OPN-O/E group, and the expression levels of phosphorylated-PI3K (p-PI3K), phosphorylated-Akt (p-Akt) and α-SMA were also significantly increased (P < 0.05 or P < 0.01). There were no significant differences in the expression levels of PI3K or Akt between the OPN-O/E and control groups (both P>0.05). 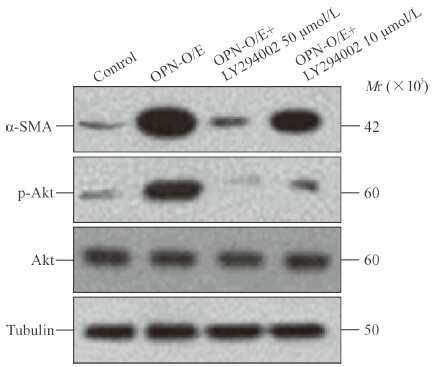 Compared with the OPN-O/E group, the expression levels of α-SMA and p-Akt were significantly inhibited in the PCS treated with 10 μmol/L or 50 μmol/L LY294002 (all P < 0.01); however, there was no significant difference in the Akt expression. Conclusion OPN can activate PSC through the PI3K/Akt signaling pathway, and the proliferation ability and chemotactic activity of activated PSC are also increased.